Metrological Traceability: Property of a measurement result whereby the result can be related to a reference through a documented unbroken chain of calibrations, each contributing to the measurement uncertainty. 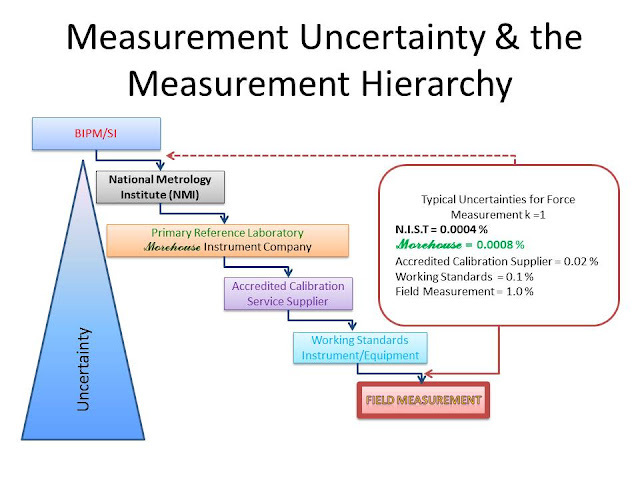 This blog will define each level of the measurement hierarchy as it related to measurement uncertainty for force measuring devices and then compare the expanded uncertainty between a Primary Reference Laboratory and an Accredited Calibration Service Supplier. The international prototype of the kilogram, an artefact made of platinum-iridium, is kept at the BIPM under the conditions specified by the 1st CGPM in 1889 when it sanctioned the prototype and declared. Primary Reference Labs use dead weight Primary Standards, usually calibrated by N.I.S.T. as the reference standard. Morehouse Instrument Company uses dead weight primary standards calibrated directly by N.I.S.T up to 533 kN or 120,000 LBF known to within 0.008 % of applied. Working standards and certified reference materials used in commerce and industry have a traceable relationship to the secondary and primary standards. 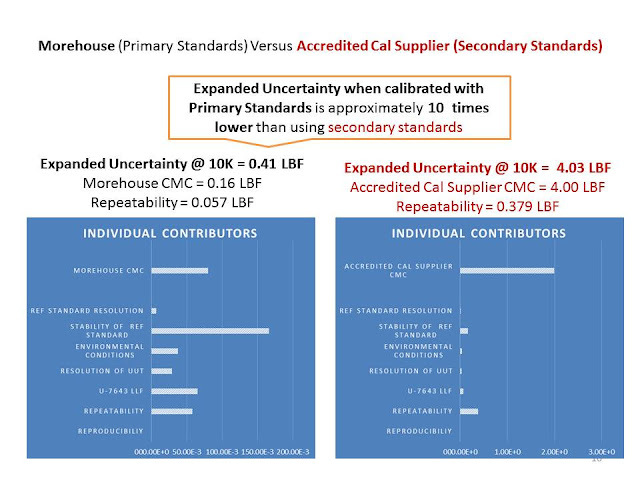 This is the category where you need to determine the the appropriate uncertainty needed to calibrate your Measuring and Test Equipment (MT&E). If you are accredited and using dynamometers, force gauges, load cells or other MT&E to make critical measurements, you will want to use a calibration laboratory with Calibration and Measuring Capabilities low enough so that the Probability of False Accept (PFA) is low enough to ensure you are using these devices within the stated tolerances. These are typically the material testing machines used for tensile, compression, fatigue, impact, rheology, structural, materials or a range of other force applications. What does this mean as far as the Uncertainty of Your Standards? Your Measurement Uncertainty is directly affected by the standards used to perform the calibration. When selecting a calibration laboratory it is important to evaluate your tolerances and the Calibration and Measurement Capabilities (CMC's) of your calibration supplier. Lower uncertainties typically equate to more accurate measurements, less risk, long term cost savings and consumer confidence. Everything we do, we believe in changing how people think about force and torque calibration. 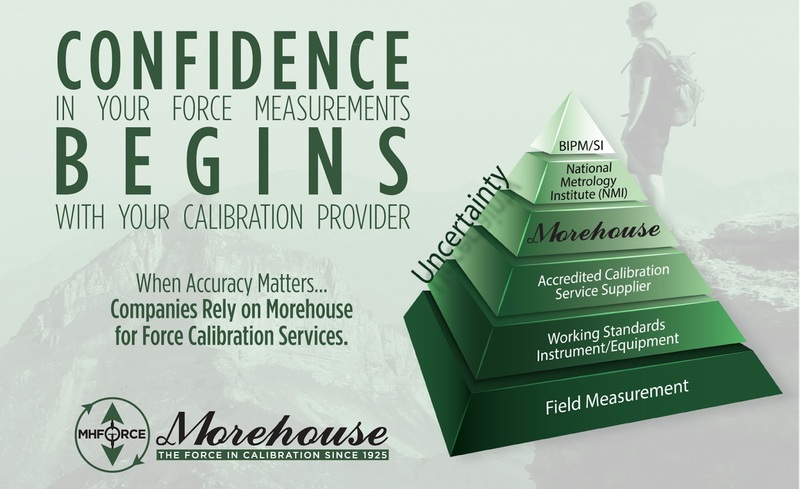 Morehouse believes in thinking differently about force and torque calibration and equipment. We challenge the "just calibrate it" mentality by educating our customers on what matters, what causes significant errors, and focus on reducing them. Morehouse makes our products simple to use and user friendly. And we happen to make great force equipment and provide unparalleled calibration services. Wanna do business with a company who focuses on what matters most? Email us at info@mhforce.com. How do you know if your device is “In-Tolerance”? Why the location of the measurement is more important than you may realize. Tensile Calibration Adapter Breakthrough! Morehouse Force Calibration Adapters for Calibration of Lifting Devices such as Crane Scales, Tension Links, and Dynamometers. © 2019 Morehouse Instrument Company, Inc.